Still brief - but with the chapters that you wanted - Steven Chapra’s new second edition is written for engineering and science students who need to learn numerical problem solving. 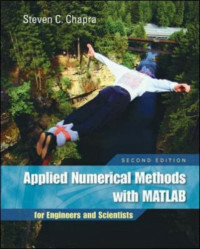 This text focuses on problem-solving applications rather than theory, using MATLAB throughout. Theory is introduced to inform key concepts which are framed in applications and demonstrated using MATLAB. The new second edition feature new chapters on Numerical Differentiation, Optimization, and Boundary-Value Problems (ODEs).